As the mobile industry continues to expand and evolve, we’re also beginning to see a surge in the type of wearable technology that could be available in the future. A recently launched Kickstarter project claims to have created the thinnest wristwatch in the world. While the CST-01 wristwatch that may not come with Internet connectivity or fancy features, the technology that goes into its design is just as impressive. The CST-01 is made of stainless steel and resembles a thin cuff measuring just over an inch in width. 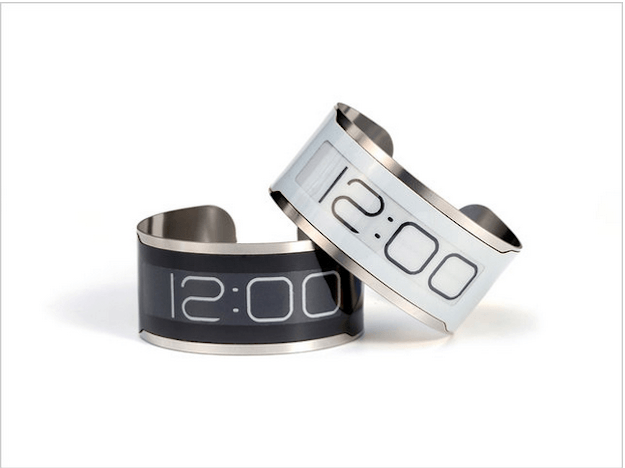 The design is what really stands out here: the CST-01 is a thin and entirely flexible band that implements the use of electronic ink to display the time. That’s right – this means there are no buttons, no dials, just the displayed time. Its designers claim that it’s the thinnest watch ever made, measuring at only 1mm in thickness. The wristband’s flexibility allows it to wrap around wrists of all sizes, and it comes with a magnetic charging station as well. This charger is also used to adjust the time, since the watch does not feature and buttons or switches. The e-ink that provides the time is the same type of low-power tech found in e-readers such as Amazon’s Kindle. It isn’t only time teller to use this display technology, but it is the first of its kind in terms of design. Previous devices applied the use of e-ink to more conventionally designed timepieces such as smart watches. “Everything about the design and engineering was thoroughly considered for its functional and aesthetic benefits,” the description on its Kickstarter page reads. “The CST-01 is the most minimal expression of a timepiece, it’s ‘time’ embedded in a band.” The designers behind the project, Dave Vondle and Jerry O’Leary, said that they planned the device’s appearance around the use of e-ink. The Chicago-born project, which launched on Jan. 8 and already boasts more than 3,000 backers, has already more than doubled its goal of $200,000. When it comes to wearable technology, projects such as the CST-01 further demonstrate the possibility of flexible display technology. Samsung has been showcasing this type of tech for quite some time, and it will be interesting to see this implemented into future mobile devices or e-readers.